Why choose AllergyEasy® oral allergy drops? AllergyEasy serum is taken as under-the-tongue drops rather than as painful injections. No more inconvenient trips to the doctor’s office for allergy shots. Oral drops have a better safety profile than shots,1 so they can be taken in the comfort of home. Pills, inhalers and nasal sprays may provide a quick fix, but that is because they only address the symptoms of allergy. 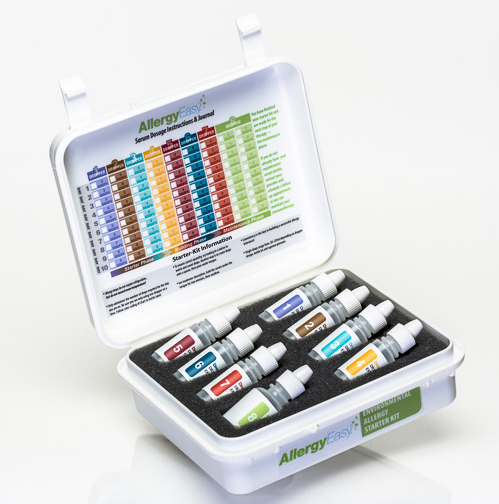 AllergyEasy drops treat the source of the problem, desensitizing the body to troubling allergens so patients don’t have to depend on temporary medications for relief. Since the allergy drops are portable, you can travel as often as you like without interrupting your treatment regimen. And if you are traveling by air, our dropper bottles are less than 3 ounces in compliance with current TSA regulations. While many treatment programs only desensitize patients to a limited number of local pollens, AllergyEasy drops contain most domestic and international allergens, offering broad coverage for on-the-go patients. No drawn-out, painful allergy testing! Routine testing takes less than 30 minutes and minimizes discomfort. *Each patient is unique, and individual results may vary.